If you have any photographs, diaries, artefacts, poems or stories to do with the First World War, them Oxford University's Great War Archive is keen to hear from you at an event in Edinburgh on Wednesday June 4th. Staff will be available to collate your contribution using computers, and to answer any questions, at Edinburgh's Central Library on George IV Bridge. The end product will be the creation of a new archive that will go online, free of charge, on November 11th 2008, the 90th anniversary of the Armistice. Scotland's clans may have been broken at Culloden, and decimated further through the economic changes in Scotland in the 18th and 19th Centuries, but many still survive in the form of Scottish clan associations. A few years ago, on the sea stack of Dun Eistean, Isle of Lewis, I interviewed Angus Morrison, of the Clan Morrison Association, for a BBC documentary, and he recalled how in the previous year a gathering of Morrison descendants from around the world had met on the sea stack, observing that it was probably the largest gathering of Morrisons at the location of the clan's old fort in four hundred years. In recent times, interest in the ancient Scottish clans has grown around ther world, helped in recent times by the growth of the internet. The Reuters news agency has an article that describes how the spread of the clan association around the world is on the increase, though not at home here in Scotland. (See Internet turns Scottish clans into global tribe). Richard Carmichael of Carmichael is quoted on his role as a modern day chief: "It's very difficult to take on a role that's historic and redundant. In the 80s, we often heard that the clans were finished because no one lived in the locality any more. A few of us fought hard to defy that and the clan has got back on course. The world wide web has made the global clan a reality." "To Americans, Australians, Canadians and New Zealanders, it's a completely staggering fact that I'm still living here near 1,000 years after the name began. The disinterest in the UK is quite marked. To them, it's just about an old building right on their doorstep." I think there is more to it than that. Many people in the past felt a sense of betrayal by their clan chiefs, when they were abandoned to economic forces and political and cultural ruin, and their descendants have long memories! Sheep were deemed more profitable, and whole communities forcibly ripped apart, leading to mass emigration to the Americas and beyond. Ironically, the growth of the clan associations is in a lot of respects being carried out abroad by the descendants of those who were abandoned by the chiefs. There is a seductive attraction to the symbols of the old Highland way of life - the individual histories of the various clans, the tartans, the kilts, the piobarachd, the Gaelic language, all of which is perceived to be uniquely Scottish. But where the clan associations, and their modern chiefs, are really succeeding is in the fact that they are bringing together people from all over the world who through a different path of history might have found themselves living in villages next to each other today. It should be pointed out that a significant proportion of Scots in Scotland today have absolutely no connections to the clans whatsoever, and never did! So if you find clan affiliation in your ancestry, embrace it wholeheartedly, and if you don't find it, don't despair, put a kilt on anyway, and then go off and look for your real history - it won't be any less Scottish...! Scotland's foremost genealogy discussion forum, Talking Scot, is hosting its annual virtual beach party for members from June 27th - 28th, which will include its fundraising tombola, with prizes this year including various books, research look ups and Scotland's People credits. Tickets are £1 each or 6 for £4. The party commences 7pm BST on the 27th, and finishes 11.59pm EST (not sure what that is in new money!). The war memorial at Gairloch in Wester Ross is to be moved to a new site by the village's Crasg car park, its current position having been deemed unsafe by Highland Council. A recent survey of the villagers found 283 in support of the move, and 51 against. St. Ronans Tattoo - and just what is a tattoo anyway?! I've just come across the fact that St. Ronan's Tattoo, the main musical event of the year in the Borders, is due to happen at Innerleithen, Peebleshire, this Sunday 1st June, from 12.00pm to 5.00pm. Details of the day can be read online at http://www.ettrickgraphics.com/Stronans/mini.htm and it looks like a good fun day out. The word Tattoo is a corruption of an old Dutch phrase "Doe den tap toe" - or "Turn off the taps". The practice started during the campaigns of the First Duke of Marlborough in the Netherlands in the 18th Century when drummers used to march through the garrison towns signalling the innkeepers to turn off the beer taps and send the soldiers home to their quarters in private houses where the reluctant residents were forced to billet them. As barracks began to be built and the army became more professional t he practice gradually evolved into a ritual at the end of the day. Devout Russian soldiers had developed the practice of singing a hymn each evening to give thanks for having survived another day and in the last century the two elements were merged in the military entertainment which we now know as a Tattoo. UPDATE: If you need somewhere to stay, Andy McKenna's just been in touch with an offer! I wonder if our comfortable holiday accommodation in Innerleithen may appeal to those (sleeps 6) holidaying in Southern Scotland whilst on an ancestral tour, or visiting Innerleithen for the St Ronan's Tatoo. I spent twelve years trying to not produce gimmick television, but eventually conceded defeat in the face of an ever dumbing down broadcast industry in 2006, when I asked for voluntary redundancy from the BBC. I know how the ideas meetings at both the BBC and STV work, having sat in many at both buildings for years - DNA in genealogy is cool, fab and trendy, let's exploit it, etc etc. Genealogy is one of Britain's fastest growing pastimes and the subject of family history is consequently becoming increasingly popular in the media. Gene Detectives, a new two-week day time show by Freeform Productions for BBC One, follows this growing fascination and hunger that now exists for finding out more about who we are and where we came from. The premise of the programme is to help people who are searching for long lost relatives and people who have already dedicated a considerable amount of their lives to finding their family members. ...Finally, since the programme transmitted we have had nearly 3,000 requests from people wanting us to help them find their relatives. The Gene Detectives has obviously struck a chord with the Great British Public. You may rest assured that your comments have been registered. My comments obviously were registered, along with many other people's from the Great British Public, as the series has not been seen since, undoubtedly because of the huge uproar the series caused in genealogical circles. I sincerely hope that the new STV series does not in any way try to mimic the pseudo science that I have highlighted in the above BBC statement. I had the great pleasure to meet Sherry Irvine this year at the Who Do You Think You Are Live event at London's Olympia. Sherry is course director of Pharos Teaching and Tutoring Ltd, the online genealogy course supplier, whose offerings include various courses of Scottish interest, including "Scottish Research Online" and "Scotland 1750 - 1850: Beyond the OPRs", as well as many other British based courses. She is also author of "Scottish Ancestry: Research Methods for Family Historians" (published by Ancestry, 2003). Sherry has just contacted me to let me know that she is now running one to one tutorials through Pharos, for those wishing to tackle a particular brick wall within their tree, and for whom a lengthy course might not seem the correct option. The one to one process is a simple one. You send Sherry your family history problem, she analyses what needs to be done, students then get a web based tutorial with expert analysis of the problem, personal guidance and a plan of action to take away. On May 13th 2008 I announced the launch of the online Scottish Parliament Records project at www.rps.ac.uk , created by St Andrews University after eleven years of work. The National Archives of Scotland were heavily involved in the project, not only in the supply of the original documentation, but also in its conservation. An account of their involvement in the project has now been posted online at http://www.nas.gov.uk/about/080516.asp - well worth a read! 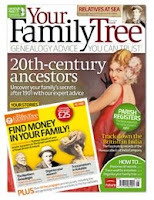 The latest Your Family Tree magazine (issue 65, June 2008) is now on sale, and includes articles on the British in India, carpenters, seafaring ancestors, tracing 20th Century ancestors and more. Yours truly has also included an article on how to get started with parish registers across the British Isles. Scottish news this in this month's magazine includes a review of Eric Richards new book "The Highland Clearances" (pub. Birlinn, £9.99), and an item on the new Museums Galleries Scotland initiative, including plans for a Scottish Emigration Museum - see our post at Forthcoming Scottish Lectures and Events - June 2008 for details on the four focus group meetings being held across the country regarding this over the next month. Last year Microsoft announced plans to digitize millions of out of copyright books and to make them available online for free, in an attempt to challenge Google Books. Now it has given up the fight, and plans to abandon the project, recognising Google's market dominance in the area. Today we informed our partners that we are ending the Live Search Books and Live Search Academic projects and that both sites will be taken down next week. Books and scholarly publications will continue to be integrated into our Search results, but not through separate indexes. Given the evolution of the Web and our strategy, we believe the next generation of search is about the development of an underlying, sustainable business model for the search engine, consumer, and content partner. For example, this past Wednesday we announced our strategy to focus on verticals with high commercial intent, such as travel, and offer users cash back on their purchases from our advertisers. With Live Search Books and Live Search Academic, we digitized 750,000 books and indexed 80 million journal articles. Based on our experience, we foresee that the best way for a search engine to make book content available will be by crawling content repositories created by book publishers and libraries. With our investments, the technology to create these repositories is now available at lower costs for those with the commercial interest or public mandate to digitize book content. We will continue to track the evolution of the industry and evaluate future opportunities. As we wind down Live Search Books, we are reaching out to participating publishers and libraries. We are encouraging libraries to build on the platform we developed with Kirtas, the Internet Archive, CCS, and others to create digital archives available to library users and search engines. In partnership with Ingram Digital Group, we are also reaching out to participating publishers with information about new marketing and sales opportunities designed to help them derive ongoing benefits from their participation in the Live Search Books Publisher Program. We have learned a tremendous amount from our experience and believe this decision, while a hard one, can serve as a catalyst for more sustainable strategies. To that end, we intend to provide publishers with digital copies of their scanned books. We are also removing our contractual restrictions placed on the digitized library content and making the scanning equipment available to our digitization partners and libraries to continue digitization programs. We hope that our investments will help increase the discoverability of all the valuable content that resides in the world of books and scholarly publications. A focus groups to provide the opportunity to discuss possible storylines and themes for the new Scottish Emigration Museum. Limited to approximately 30 attendees. An illustrated talk on the history of carts, creels, sleds and slypes in Uist and Tiree. Sat 21 JUN 2008 10.30am, Marine Harvest shed, Lemreway, Isle of Lewis. The third Perth & Kinross Family History Fair will take place on Saturday 23rd August from 10am to 4pm. Bigger and better than before, the fair will take place in five different venues in Perth and you can visit them all by vintage bus courtesy of Stagecoach. The Library and Archive based at the A. K. Bell building have been joined by the Registrars, Perth and Kinross Heritage Service, the Black Watch Museum and Bereavement Services. Talks will take place in the Museum in the morning and in the Library Theatre in the afternoon. Hands on training sessions will take place in the library computer suite. Many organisations will be exhibiting on the day and if yours would like to be one of them, the Library would like to hear from you! Watch their website www.pkc.gov.uk/localstudies or look out for the event leaflet closer to the time. At long last, the southern Irish government has set up a committee to devise an annual commemoration for one of the greatest injustices ever to be visited on the island of Ireland. The Irish Famine of the 1840s, which saw 1.5 million people either die from starvation or forced to emigrate to escape the hunger caused by a series of devastating potato blights, is known in Gaelic as "An Gort Mor", "the Great Pain", and has been commemorated annually in Montreal since 1859, where many of the migrants fled to in its aftermath. Hopefully the government of the north will follow suit, as the famine there affected both Protestants and Catholics, and was as much as a national tragedy there as it was in the south. A new military exhibition gets underway from Friday 23rd May 2008 until Sunday 1st May 2009 highlighting the various fighting techniques of Scottish soldiers over the centuries. Entitled Call to Arms, the exhibition at Edinburgh Castle will concentrate on the four main archetypal Scottish warriors - the 15th Century mercenary Gallowglass ("Gall oglaigh" - "foreign warrior)", the 17th Century Highland warrior, a 19th Century Scotsman in the British Army, and the modern army. Today saw the start of a new six part series on BBC Radio Scotland which looks into the history of various properties in Scotland, and shows how to research a property's past. The first episode looks at Smithy House near Castle Douglas, the Bay Horse in the Gatehouse of Fleet and how to start research into a property by visiting Registers of Scotland in Edinburgh. On Tuesday, Culture Minister Linda Fabiani MSP launched the book which reveals the archaeological and historical findings from the site of the Scottish Parliament. Scotland’s Parliament and the Canongate: archaeology and history, details the complex task when a team of archaeologists, historians, specialists in historic buildings and scientists - led by Historic Scotland - began, at that time, the country’s largest archaeological excavation in 1998. The book documents the archaeological excavation and research, and the architectural and historical analysis of the site of the Parliament, and places it in its wider context in the medieval burgh of Canongate. A key part of the study was the investigation of Queensberry House – a major 17th-century urban palace on the edge of the site. I visited Australia last year, and during the trip came across the most amazing wee cemetery on Rottnest Island, about an hour's ferry trip from Freemantle in Western Australia. It is believed that only thirteen people were buried here, all from British and Irish backgrounds, with the names of only seven known. I photographed all the stones and the cemetery, and have placed a selection of the pictures online at http://scotsgreateststory.tripod.com/id23.html along with the names of those whose graves are known. So if one of your ancestors disappeared from the records in the 19th Century, and was Australia bound, why not pop along to the page and see if they made it as far as Rottnest Island...! Findmypast.com has now published online burial index records from the parish of Selby, as collated by the Federation of Family History Societies. These comprise over 10,000 records from Selby cemetery in the West Riding of Yorkshire, as well as over 800 records from Bubwith All Saints in the East Riding of Yorkshire. The Scottish Brewing Archive has handed the reins over for its collection to the University of Glsgow. Set up in 1982, the archive hosts thousands of records and books kept by the various brewing companies in Scotland. The collection, to join the university's Business Archive, will be accessible to the general public. Ancestry.com is making its entire U.S. Military Collection - the largest online collection of American military records - available for free to the public. From May 20th to May 31st, you can log on to http://www.ancestry.com/military to view more than 100 million names and 700 titles and databases of military records, the majority of which come from the US's National Archives and Records Administration, from all fifty of the U.S. states. In addition, Ancestry and NARA have announced a new agreement to make millions of digitised historical records available online. The initial NARA collections to be digitized under the new agreement include INS Passenger and Crew Arrival andDeparture Lists from 1897-1958 and Death Notices of U.S. Citizens Abroad from 1835-1974, which have not been available to the public outside of NARA research rooms before now. Ancestry already hosts the entire collection of US Federal census records from 1790 to 1930, passenger lists from 1820-1960, and WWI and WWII draft registration cards, all of which are held by NARA. I had never heard of a forum entitled Scotland's Family Tree (ScotFamTree) until last week, and so had a look earlier today. The site is a subscription based forum whereby members contribute and benefit from the many resources it has to offer, with different levels of membership available through separate tiers, including a basic free membership. The National Wallace Monument, the 220 foot tall tower built to commemorate the Scottish freedom fighter Sir William Wallace, is to receive a new visitor centre at the base of the Abbey Craig in Stirling, on which it is situated, alongside a new restaurant and ticket office. The plan is for the work to be completed before the start of the tourist season in 2009. Hopefully they will take the opportunity to remove the really terrible statue of Mel Gibson in the car park! Findmypast.com has unveiled its brand new version of the 1901 census. Records from the first two counties, Somersetshire and Gloucestershire, are now online, and the remaining counties will be added over the coming months. The company has completely retranscribed the 1901 census from scratch, with a variety of search fields now available, making it possible to search for an individual using, for example, their calculated year of birth, their age, occupation, or address. You can also choose in what order you want to view search results - by birth year, oldest first; by birth year, youngest first; alphabeticaly by name A to Z or alphabetically by name Z to A. In addition, the free search results include the name of the county of residence, helpful if you do not know the name of a registration district. All of these features have also been added to all the other censuses at findmypast. Search criteria are now also retained, making it easier to carry out the same search across all the censuses. It is findmypast's aim to offer a full set of English and Welsh censuses online by the end of 2008. Findmypast.com was acquired in December 2007 by Scotland Online, the company which won The National Archives' tender to publish online the 1911 census, and the parent company of the ScotlandsPeople website. The family history arm of the Church of the Latter Day Saints, FamilySearch.org, has placed a beginners guide to Scottish ancestry online for the early statutory period, which commenced in 1855. Entitled Finding Records of your Ancestors Scotland 1855 - 1901, the site contains some basic tips, charts and information to getting your research underway. The 26 page document is a PDF file which can be downloaded to your computer, and is accessible at http://www.familysearch.org/Eng/docs/Finding_Records_Scotland.pdf . There is also an English equivalent at http://www.familysearch.org/Eng/docs/Finding_Records_England.pdf - worth looking at if you are just starting out. New book on the Ruhleben British civilian POW camp in WW1 Germany from Manchester University Press. It is with a great deal of pleasure that I have finally been able to read the just published book British Civilian Internees in Germany: The Ruhleben Camp 1914-1918 by Matthew Stibbe (Manchester University Press), the first serious study of the Ruhleben POW camp since J. Davidson Ketchum's great work "Ruhleben" (1965, Toronto Press). During WW1, Ruhleben, a former racecourse on the outskirts of Berlin, housed some 5500 British civilian POWs (including hundreds of Scots, my great uncle John Paton included), in the first ever concentration camp on German soil. Unlike Ketchum's earlier study, drawn largely from questionnaires filled in by former prisoners at the camp, Matthew's book not only gives a chronology to the Ruhleben story itself, it also looks at the wider impact of the Ruhleben story in wartime diplomacy and propaganda, as well as the place of Ruhleben in the British memory of the war. Thoroughly recommended, and available from www.amazon.co.uk and www.manchesteruniversitypress.co.uk . NB: If you had a relative interned at Ruhleben, visit my free to view online Ruhleben Project at http://ruhleben.tripod.com where details of over 1700 of the POWS have been researched and made available online, along with photos and other memorabilia in many cases. Having joined the Largs and North Ayrshire FHS in January, I was finally able to attend one of their meetings last night, which was in fact the annual general meeting, held at the local library, at which various reports were given on the society's past year's successful series of talks and visits. The organisation celebrates its twenty first anniversary next year, so there is no better time to join, with annual membership costing just £12, or £15 for family membership or overseas. The society's Spring Journal (no. 53) has also just been published, and contains articles on the Buchanites, tracing Merchant Navy ancestry, DNA and genealogy, and much more. For more information on what the society has to offer and on how it can help with your research, visit the website at http://www.largsnafhs.org.uk/. In this month's Practical Family History, read articles on how to date family photographs, death certificates, the story of Postman's Park, mariners records, and much more. Yours truly also contributes a case study, reflecting on how an American based client of mine got rather more than she bargained for when I researched her family tree for her. Geni.com has just updated its GEDCOM facility, allowing it now to take up to 5000 names on an import, as opposed to 2000 names through its previous incarnation. The site is completely free and allows you to not only chart your family history, but to interact with your family and friends through its social networking function. For me, its best function is its online charting facility - lots of fun! For more information visit www.geni.com. The culmination of over ten years’ work by researchers from the Scottish Parliament Project based in the School of History at the University of St Andrews, the new edition seeks to make this key historical source freely available to all in a technologically advanced and user-friendly format. The Spectator has a classic article this issue (May 3rd 2008) entitled "Sorry, but family history really is bunk". In his opening paragraph, the ever wise Leo McKinstry outlines where he is going on this, saying that "the current craze for genealogy reflects an unhealthy combination of snobbery and inverse snobbery, and is a poor replacement for national history". He continues with the observation that "the belief that there is something intrinsically interesting about a family's origins is badly mistaken", then basically makes the case that the whole genealogy boom is a clever plot by the government and the BBC ("the chief propagandist for the political values of our age") to cover up the impact of modern immigration by encouraging the message that Britain has always been a land of immigrants etc. In 1693 the first ever pictorial survey of Scotland was published by military engineer John Slezer, in his Theatrum Scotiae, a volume of detailed engravings that show important Scottish towns and buildings from over 300 years ago. More than 70 drawings from this collection have now been digitised and made available to view by the National Library of Scotland at http://www.nls.uk/slezer/index.html. My wee boy, seven years old, was awarded best Anchor Boy at his Boys Brigade display tonight here in Largs! If genealogy is all about family, tonight he wrote a big chapter for himself - you haven't seen a smile as bright as his this evening...! I've been on about this for a while, but back home in Northern Ireland, dissent over the high prices of UHF's online records pricing, as well as the IFHF, is making itself heard in the local press. A full page article by Fiona Jones in New Jersey, USA, has just been carried in the Mourne Obersver in County Down, with the usual standard UHF response rehashed at the bottom. The University of Strathclyde is hosting an International Genealogy Festival from 21-24 July 2009 as part of the country's Homecoming Scotland programme for the year. There will be exhibitors and lectures etc, as well as a ceilidh. For more information visit www.strath.ac.uk/homecomingscotland or contact homecomingscotland@strath.ac.uk. Northern Irish street directories online - again! Not sure if this is the final URL, but the PRONI street directories for Northern Ireland, from 1819 to 1900, have been digitised and can once again be found online for free at http://proni.aetopia.com/scripts/WebObjects.dll/StreetDirectories . These briefly popped up on the internet last year, and just as quickly disappeared. This link is not accessible through the main PRONI website yet, though it will soon be made available from them. A new television series, A History Of Scotland, will start on BBC Scotland in November this year, with a screening on network BBC Two at a later date. The series will form the backbone of the BBC's new Scotland's History initiative, and will be accompanied by concerts at historic locations, a programme of events and various projects on Radio Scotland, such as What You Didn't Learn At School, The Gaelic/Lowland History Of Scotland and Scottish History – The Missing Bits. A History Of Scotland, the main flagship series, is being co-produced with the Open University and shot in high definition. Presented by Neil Oliver and executive produced by Richard Downes, the series will be broadcast in two parts, with the first five episodes transmitted this winter, starting with the origins of Scotland and ending with the Unions of the Crowns in 1603; this will be followed by the second part, which will go out late next year, taking the story from the Covenanters to the present day in the devolution era. Under the umbrella of the broader Scotland's History project, a new website will also be phased in alongside the series, which will build up an interactive timeline of the country's past as a home for BBC Scotland's new and archive history content, providing on-demand access to video, audio and interactive elements, such as maps, timelines, audio-tours, listings, games, public contributions, and a dedicated educational section for learners and teachers. Off-screen activity will include a major series of BBC Scottish Symphony Orchestra concerts, which will be held at historic locations, with music from the television series performed alongside a celebration of Scottish music from across the centuries. The concerts will be supported by Registers of Scotland as part of its public engagement activities, and roadshows and other events are also being planned. UPDATE: Just discovered that two of the directors on this series are Andrew Thompson and Jane McWilliams, both former colleagues of mine at the Beeb. It will definitely be worth watching, as they both really know their stuff...! Ever looked at an OS map and wondered what the Gaelic place names mean? Edinburgh's Telford College is about to run a four week course on the basics of pronunciation for those place names that seem hard to pronounce, so that you will never again get lost on your Highland trips. A quick plug for a book that I spotted for sale down at WDYTYA - "Family History for Kids" by Emma Jolly. It's a great wee book that can get the we'uns involved from a young age, and whilst designed for children following the English and Welsh National Curriculum, it is not specific to history down south, and is just as useful for Scottish based kids wishing to learn about and record their history. I met Emma at WDYTYA, she spent some considerable time and effort to get the book right for her audience, and the quality really shows. Worth every penny! For more info, visit Emma's site at http://www.genealogic.co.uk/10.html or the publisher, Pymer Quantrill, at www.pqpublishing.com. The Scottish Catholic Archives is planning to send some of its documents to the University of Aberdeen, prompting concern amongst historians and academics of a split in the collection of rare material which goes back centuries. The Scottish Catholic Historical Association is particularly unhappy and plans to circulate a petition to reverse the move. For more information, visit http://news.bbc.co.uk/1/hi/scotland/7380046.stm, and for the archive website itself, visit http://www.catholic-heritage.net/sca/. NB: The SCA holds the Roman Catholic baptismal and marriage registers for Scotland, which have now been digitised by the GROS. Once indexing has been completed, these records will be made available through Scotland's People. I also caught up with Rebecca de Saintonge and her husband Robin at the Lifelines stall (www.lifelinespress.co.uk), who specialise in turning family histories, written by customers into quality books that will last for decades, if not centuries. Like myself, Rebecca is ex-BBC, and is trying to put her many years of editorial experience into good use within the genealogy market. The books are an outstanding quality product that are designed to be printed in limited runs and then handed down from one generation to the next. Well worth a look! Scottish universities were represented at the show, with both the Distance Learning genealogy courses team from the University of Dundee and the postgraduate programme in Genealogical Studies from Strathclyde casting for trade from their respective stalls. I was pleasantly surprised to bump into Gary Smith from the University of Dundee's archives - we were interviewed together on Radio Scotland's "Digging Up Your Roots" earlier this year. Definitely an archive to visit, with some excellent hidden gems! Alastair MacDonald and Bruce Durie were there from Strathclyde, joined by some of the London based postgrad certificate students. For Dundee's courses e-mail for more info at armtraining@dundee.ac.uk, and for Strathclyde, visit the website at www.cll.strath.ac.uk/cpd/genealogy. Oh, and here's Ali...! We are all waiting with anticipation for the recently digitised pre-1855 death records held by GROS to be made available online both at the GROS and on Scotland's People. There is, however, another source for almost 14,000 online deaths for pre-1855, located at www.worldvitalrecords.com. Here's the blurb from the site: "The Scottish Death Records were extracted from parish records of the Presbyterian Church of Scotland. Specific parishes include Cockpen, Midlothian; Cranston; Crichton; Dalkeith; Dunfermline, Fife; Edinburgh; Fala; Gladsmuir; Heriot; Humbie; Newbattle; Pencaitland, Midlothian; Prestonpans, East Lothian; Salton; Shotts; Tranent, East Lothian. Record information may contain family relatives, occupation, residence, cause of death, the modern cause of death, the individual’s parish, county, and estimated date of birth". The database was created by Shauna C. Anderson, Ph.D, Department of Microbiology and Molecular Biology, Brigham Young University. Thanks hugely to Whitney Ransom and the rest of her World Vital Records team from America for taking me through this site. Well worth a look, and accessible for $5.95 a month, though be warned that it is an automatic recurring billing site! FindmyPast and Family Search were both there promoting their ongoing journey to help us search for our ancestors, and some interesting news from them. They have formed a partnership together which will see them collaborating on some major new records sources. First up is a project to digitise the Chelsea Pensioners records from 1760 to 1914, followed secondly by the Merchant Seamen's collection of records dating from 1835 to 1941, many of which contain photos of the sailors in question. The records are held by The National Archives at Kew, and will be a serious addition to the genealogists' arsenal, which should take about three years to complete. There was also news from FindmyPast on their venture with the archive concerning the 1911 Census for England and Wales - a preview site is now up and running at http://www.1911census.co.uk/. Here's Findmypast press guru Vicky Perry and colleague, about ten minutes before the hungry genealogical hordes overran the venue...! Also on the census front, I caught up with Nicki Dray and Nigel Bayley at S&N's stall - they have some major additions for the Genealogist website soon, in the form of a better search interface that will allow you to search by address and even by Christian name, if for example you know the names of all the children, but not the surname. They also have the BMD registers for England and Wales, including the earliest records of births with linked images of the certificates (pre-1837). These include non-conformist records dating back to the 1650's, as well as Quaker records, and soon clandestine marriages perfomed outside the Fleet prison will be joining the collection. Check out S&N's http://www.thegenealogist.co.uk/ . Family Search also gave a me a tour of their sites at http://www.familysearchindexing.org/, http://www.labs.familysearch.org/ , http://www.wiki.familysearch.org/ , and http://www.familyhistoryarchive.byu.edu/ . Keep an eye out in particular on the second of these - Irish statutory records indexes are due to appear here in the near future. Some other news then....! Some may recall last year that a series of Belfast street directories suddenly appeared online as if by the grace of God, only to disappear into the mists just a few weeks later. They were apparently put online by the Public Records Office of Northern Ireland, but no reason was offered as to why they suddenly disappeared. Well, it turns out that they were mistakenly put online on a demo site by PRONI's contractor, and removed as soon as the error was spotted. The good news is they are returning to the new revamped PRONI site in the very near future. Even better news is that PRONI are finally going to be putting up a new online catalogue on their site later in the year, to be known as ECATNI. Other online projects soon to appear will also include an index to Dicoesan wills and a list of 1760s householders. Also from Ireland, I caught up with the team from the National Archives in Dublin. I threw myself onto them with tears of joy at having provided access to the 1911 census for free. They are certainly loving the feedback that they are getting! I had thought that the entire 1911 census would not be available in its entirety until mid-2009, but they have assured me that it should all be online at the end of this year. Bless you, bless you all....! Need to read about your rellies 200 years ago? Try the Times online site at www.timesonline.co.uk/archive which launched at the show. It is the same archive which has previously been accessed through some local libraries, but now with a new user interface and available for subscription to the public. Sorry, that should read it will be available for a subscription - right now, access is free, and will be for about two months as the site goes through its soft launch phase. Another fun discovery was a new online family tree programme site at www.geni.com which also has a social networking facility akin to Facebook, and which is completely privately secured, You place your tree on the site, and only invited members can view, but it does a lot more than just keep your research together, and is maybe best described as providing a tool for both family history and family present. And it is totally free, which I still don't understand...! The best T-shirt of the event was spotted on their stall - a picture of a family tree with the words "Who's Your Daddy?" written across the top...! Next year's WDYTYA show is going to be much earlier, at the end of February. There was some dissent from some vendors about this, but it seems to be down to an issue of availability. Finally, a huge thanks to Claire Massey and to Vivienne for a great two days on the stall at Family History Quests (www.familyhistoryquests.co.uk). It was a lot of fun helping out, and definitely a business to keep your eyes on, with some great products on sale including much of the Archive CD Books Collection, of particular interest perhaps to Scots on the ancestral hunt. To show my appreciation, here is an image of the great Dan-Meister himself, Mr. Dan Snow, with his pops during one of the Super-Theatre lectures. Try not to faint Claire...!